Toon Tellegen is a Dutch poet, writer, physician and widely read author of children's books, most of which feature anthropomorphized squirrels and ants. In 2010 I discovered two of his books on the shelves while working as a bookseller and fell in love. I was instantly taken back to my childhood favorites - Winnie-the-Pooh, The Wind in the Willows, and anything by Beatrix Potter or Tasha Tudor. 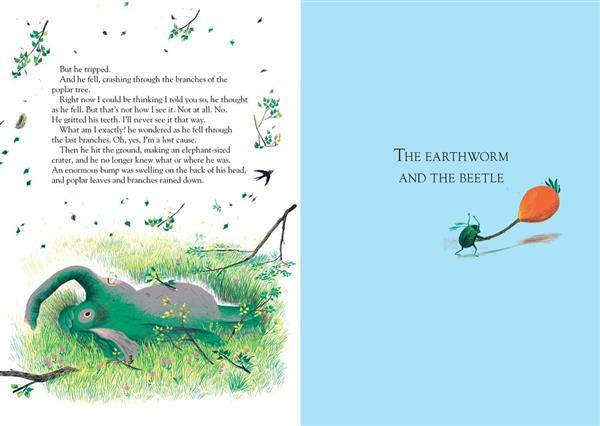 These authors and illustrators created lush, sometimes dangerous, pastoral worlds where animals spent time thinking about things. And packing and having magnificent picnics. The Squirrel's Birthday Party and Other Parties & Letters to Everyone and Anyone, with their small trim size and superb production values (embossing on the bookcase, ribbon bookmarks, illustrations by the marvelous Jessica Ahlberg on every thick, creamy page) impressed me greatly and reading them to my youngest, who was five at the time, was a joy. I was SO excited to find The Day No One Was Angry, with superlative illustrations by Marc Boutavant, on the shelves of my favorite bookstore while traveling last month. 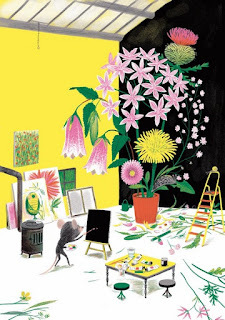 Boutavant's illustrations remind me of very early Richard Scarry and Roger Duvoisin, but with more depth and detail and a palette that recalls the 1960s. His characters are expressive, serious and silly, and his settings are expansive with many hidden details to search for. While I thought that Jessica Ahlberg was the perfect partner for Tellegen, Marc Boutavant seems spot on as well. 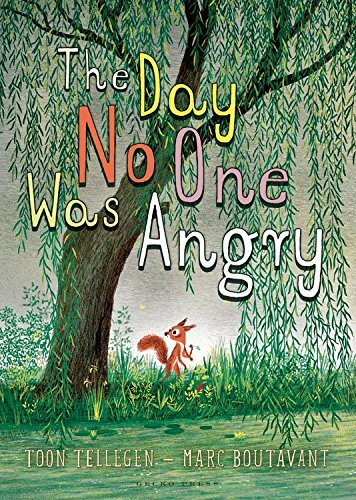 While not a sequel to The Squirrel's Birthday and Other Parties or Letters to Anyone and Everyone, The Day No One Was Angry is definitely set in the same world. Eleven chapters feature forest creatures experiencing and coping with anger in myriad ways. The final chapter, The Day No One Was Angry, is as surprising as those that come before it, for what seems to be promised and what is actually delivered. The thing I love most about Tellegen, and my childhood favorites, is that his stories are thoughtful, even philosophical at times, without being moralistic, preachy or dogmatic. The lack of firm answers to questions posed or the curious nature of the characters are prefect springboards for conversations with kids, which is a reason to read this out loud. It is fascinating to see anger presented in so many different ways, and while they may seem ridiculous to adults, young readers will understand the logic. In the first story, The Hyrax, the creature makes his way to a mountain top as the day ends, every day, and rants at the sun for setting, challenging him to not set, just this once! The Hyrax wears a had so he doesn't have to see the sun during the day. The story ends with the Hyrax convinced that no one every listens to him. In The Lobster, the Lobster, a traveling salesman, knocks at the door of a Mouse painting a still life and tries to sell him different kinds of anger from his suitcase. The Mouse has all the kinds of anger on offer, but is intrigued by a slip of "light-blue, transparent melancholy" at the bottom of the suitcase. He slips it around his shoulders and, after the Lobster leaves, sits by the window, sighing deeply. 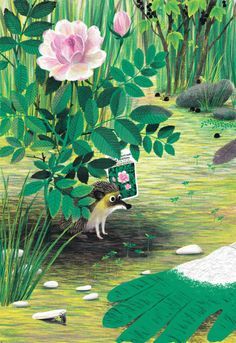 A Hedgehog sits under a rosebush thinking of all the things he's been. He has been joyful and sad and content. But had he ever been angry? He, "badly wanted to be everything, even if it was only once." He tries to be angry, but struggles. Finally, he writes, "I am angry," on a piece of bark which immediately swept away by the wind. Hedgehog worries about someone finding his letter, then wonders if he has ever been careless, or reckless even, as he falls asleep, content again. The wind rips the bark to pieces. 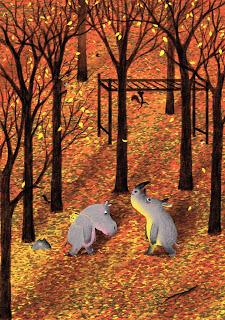 A Rhino and a Hippopotamus meet on a path, blocking each other's way. They try to resolve the situation, each one refusing to move. They consider getting angry as a way of getting things moving, but neither beast is interested in that. They share a meal and have a dance, making sure that they don't pass each other on the narrow forest path, and enjoy each other's company, parting ways peacefully in the end. 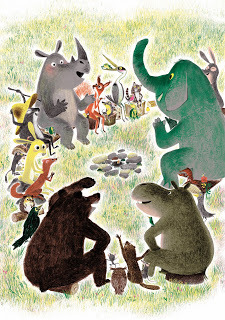 In the final, titular story, all the animals gather on a day when anger seems to have disappeared. They do things that should be making them anger, but anger is not there and they are unsure what they should feel. In the midst of this, Ant turns to Squirrel, who has meandered through many of the stories, and says, "I fear the worst." 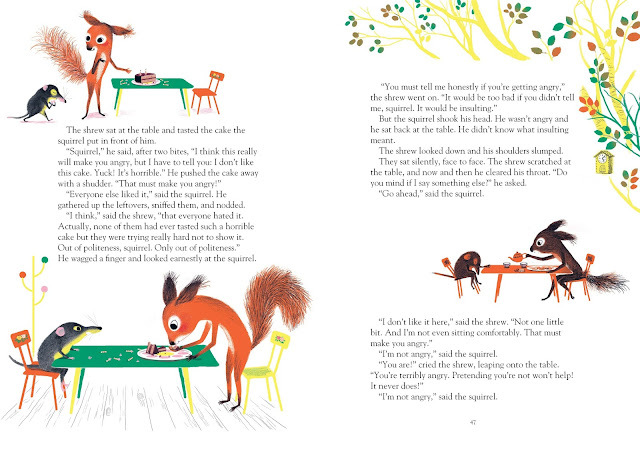 By the end of the story, Squirrel checks in on his friend. Ant is, "still afraid of things," but no longer fears the worst. The squirrel nodded, trying to come up with something to get angry about, and asked no more questions.